DNA – an information storage and retrieval system that contains coded information. Where did the information come from and who encoded it? Soft Tissues in Dinosaur bones – Bones alleged to be tens of millions of years old contain soft tissue. Tissues that should not survive tens of millions of years. How is that possible? Are the bones really that old? Information – How can materialistic processes influence or affect non-material biological components? such as the brain’s ability to see depth perception, reason correctly (use logic), the ability to use language. Consciousness – How does a non-conscious material object – like a rock, become a conscious living being? Question Evolution Day is a grass roots movement promoted by sites such as Creation.com and The Question Evolution project (https://www.piltdownsuperman.com/p/question-evolution-video.html) in addition to this site. Real operational science is testable, reproducible and falsifiable. Which of course excludes Darwinian evolution, since it is neither testable, reproducible nor falsifiable – at least it can’t be falsified to the satisfaction of Darwinists. Nevertheless in the scientific spirit of inquiry it is good to examine what many believe to be the “science” of evolution. 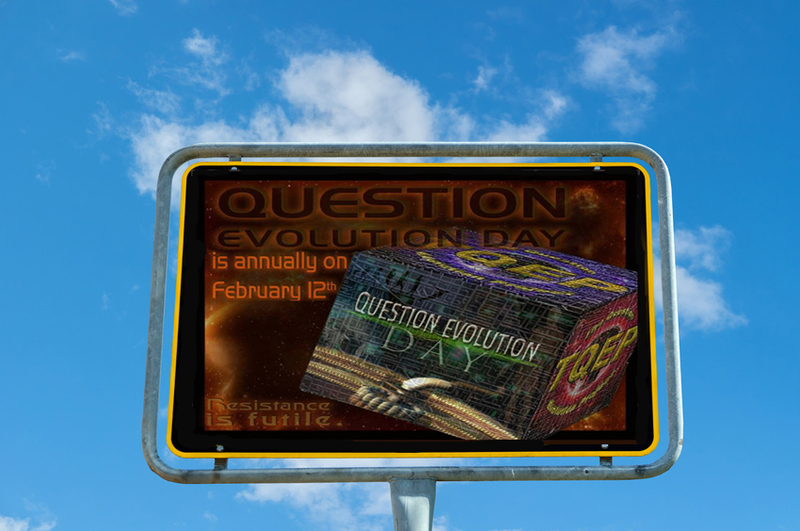 Creation.com and The Question Evolution Project have established February 12 – Darwin’s birthday – as Question Evolution Day. A day to inquire about and question a theory many erroneously think has been established as a “fact” due to the incessant cheerleading by its advocates. Evolutionists claim that evolution is not a religion. That becomes increasingly difficult to believe as they act more and more like devout followers of a faith based religion. In addition to having doctrine, discipline for those who disagree with the faith, preachers and teachers, they now also have a holy day. Perhaps you’ve heard of it: Darwin Day, a celebration held on the anniversary of Darwin’s birthday, February 12. If the practice of evolution wasn’t looking like a religion before, it certainly is now. I wouldn’t even be surprised if they begin to exchange gifts on Darwin’s day. For the Darwin’s day just past, astronomer Phil Plait who appears on science programs such as How the Universe Works, tweeted a link to an article he wrote in response to questions from Creationists pointing out problems with evolutionary theory. 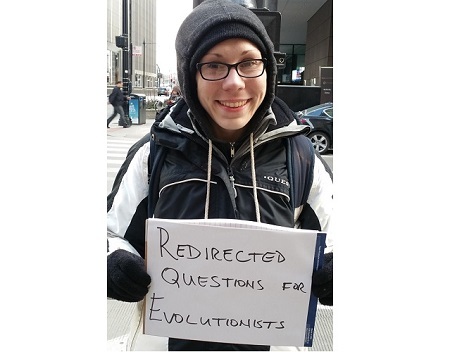 (The questions are appropriate for Question Evolution Day, which is held on the same day as Darwin Day, but were in fact asked at the Bill Nye/Ken Ham debate.) In his article “Answers for Creationists” Phil addresses the questions from the secular consensus view – that is to say from the “evolution is true/fact” perspective. 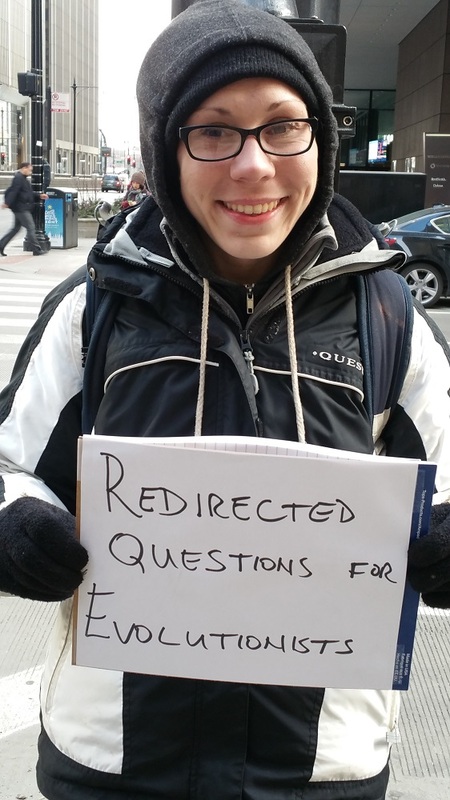 On BuzzFeed, there is a clever listicle that is a collection of 22 photos showing creationists holding up questions they have for people who “believe” in evolution. These questions are fairly typically asked when evolution is questioned by creationists. Some are philosophical, and fun to think about, while others show a profound misunderstanding of how science works, and specifically what evolution is. He goes about answering the 22 questions from creationists. Given his answers (when he has them – for some he doesn’t and never will), I’d like to look at how we as creationists can better formulate the questions to minimize wiggle room. The problem is many of the questions are imprecise, or mix theories, thus giving him (and all evolutionists) plenty of wiggle room through which they drive a truckload of nonsense. The result being, evolutionists continue in the belief that creationists are wrong about origins and don’t understand science; while evolutionists are correct and properly understand science.